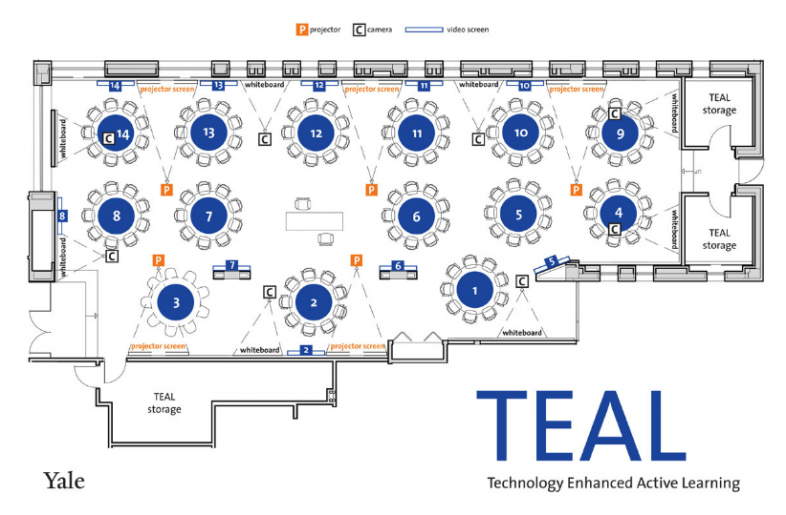 The Technology Enhanced Active Learning (TEAL) classroom is a resource at Yale University that can facilitate a dynamic learning environment. This classroom is located at 17 Hillhouse Avenue Room 101 and is equipped with round tables for small group work, multiple projectors, screens, and whiteboards accompanying each table. The TEAL classroom also includes a podium with the ability to project all around the room (see “Downloads” at bottom of page for podium user guide). Tables also contain microphones that allow students to report out to the class. As an Active Learning Classroom (ALC), the TEAL is meant to encourage engaged learning, collaborative projects, and team-based problem-solving. Research into ALCs suggests that with the right teaching methods, ALC environments can significantly improve student motivation, performance, and passing rates. Instructors can reserve the TEAL classroom through the Center for Teaching and Learning by completing and submitting a request form. The TEAL classroom can be particularly effective for courses that utilize problem-solving approaches. When using the TEAL room for courses that emphasize problem solving, instructors can ask students to use their “Table + whiteboard” as a mini-laboratory where they actively solve problems in groups. Problems can be posted to the flat screen and projectors. The instructor should keep in mind that the flat screens are easier to read and the projectors take up board space. Instructor can post problems to the flatscreens and read them out. Instructor can give students 2 to 4 minutes to read through/digest/process the information. One student from each table then sketches the problem on their whiteboard, after which the role of scribe rotates. Instructors should ensure students know that the table works as a team to find the solution, not just the scribe. Instructor encourages everyone at the table to be part of the problem solving process. With whiteboards for each group, every student can share perspective, encouraging their ability to work as a team. If the problem is difficult and only one or two tables reach the answer, the instructor can provide closure by reviewing main points on one of boards W1-W8, each of which can be projected around the classroom. Avoid using the TEAL room as a lecture hall for over 100 students if possible. Instead, use the room for class sizes around 40-80 students. Use 8 tables with 6-8 students/table. Integrate 2-3 discussion questions/problems to solve during class to provide natural breaks. View a group+table as a “mini-laboratory.” Each of the students in the group can be seen as team members working together to investigate or solve a common problem. Use the all-around LCD screens to post discussion questions. Turn off the projectors as they do not illuminate well and take up extra board space. Lecture straight in small doses only. Additionally, use one of the W1, W2 boards, which project all around the room, to intersperse interactive notes and examples for students. Use moveable whiteboards when necessary. Keep in mind that not all tables have whiteboards right next to them. Bring a box of dry erase markers, e.g. 1 marker per table, as the room often runs out. Take notice of missing equipment such as batteries for microphones, pens, etc. Have one instructor or teaching fellow per 20 students in the class. These individuals can circulate the room and guide students in their group work. More information on the TEAL, including classic pedagogical strategies, can be found here. For instructors teaching in the classroom and requiring immediate support, please call 203-432-2650 and press 1 for an AV emergency. Instructors can also report an issue via the automated ticketing system at classroom.support@yale.edu. Here is a step-by-step pictorial instructor guide for using the TEAL classroom podium and associated technology.